Fence posts are the glue that holds your fence together. They are the most important structural component of any fence, as they provide the foundation that supports the fence’s rails or boards. 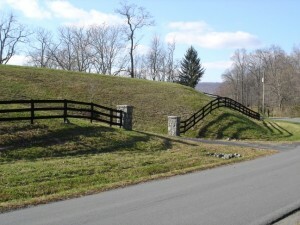 In addition, fence posts serve as an aesthetic component of the fence, with posts caps that add a nice visual touch. Learn everything you need to know about fence posts in our blog! Fence posts hold the railings up on this classic 3-board fence. There is no factor more important in the success of a fence than the installation of the fence posts. Fence posts need to be installed at a certain distance from each other and a certain depth in the ground in order to be able to support the weight of the fence. The number of posts depends on the kind of fence and material being used. A steel fence will need more posts in order to support the heavier steel. Security fences are also generally more heavy duty and will need more posts to support the fence. This is why it’s a good idea to have a professional contractor install your fence. An experienced contractor knows how to distribute the fence posts and how to set them so they can properly support the fence. Fence posts are usually made from the same material as the fence. This includes wood, vinyl, or metals including steel and aluminum. Generally, wood fence posts are the most affordable, followed by vinyl, follow by metal, though this can vary greatly depending on the height of the post and any customization options. Fence post caps are commonly used to adorn the top of the fence post and give it a nice visual touch. Post caps can be understated or attention-grabbing depending on the style of the fence. The best thing you can do for your fence posts is to ensure that the area around them is kept free of debris. This is because when it rains, debris collects water, which then soaks into the ground around the post. If the earth around the post becomes saturated, then it can loosen its grip on the post, causing the post to become loose and shift in the ground. This can end up with the post being unable to support the fence. So, make sure to keep the area around the post free of debris. Also, if puddles usually form around the post, move some earth to have the water drain away from the post, instead of around it. Hercules Fence of Richmond has been providing professional fence installation and service in Richmond for more than 50 years. Check us out in action! Call us at (804)752-7992 or contact us on our website to learn more about fencing in Richmond. This entry was posted on Thursday, June 25th, 2015 at 9:17 pm. Both comments and pings are currently closed.